If you're looking to explore your Irish roots, or just wanting to make an easy delicious bread, try throwing together a traditional Irish dish that is good any time of the year, not just St. Patrick’s Day. When I was a kid, I can't remember a Sunday morning without warm soda bread. You can whip up a dough in a short time since you don't have to wait around for your dough to rise. 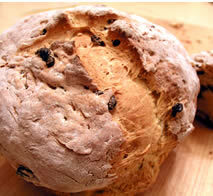 Similar to a scone dough, soda bread bears a similar density, and also flexibility as a scone. You can add various nuts and raisons to add flavor to your dish. Try adding dried currants or dried apricots as well as walnuts or almonds. Sift the flour, baking powder, salt, sugar, brown sugar, and baking soda into a large mixing bowl, and then stir in the raisins and caraway seeds. Add the buttermilk and stir until it forms a dough. Turn the dough out onto a well-floured surface and knead it for 1 minute. Halve the dough, with floured hands shape each half into a round loaf. Transfer the loaves to a lightly greased baking sheet. Cut an “X” across the tops of the loaves with a sharp knife. Bake the loaves in the middle of a preheated 350°F. oven for 45 to 55 minutes, or until a tester comes out clean. Transfer the loaves to racks and let them cool.